Animal protection agencies in the West are winning the battle against the suffering caused by overpopulation. In the Middle East, the struggle has barely begun. The problem of animal overpopulation is massive. And so is the suffering that results from it — starvation, cruelty, disease — for literally millions of animals. 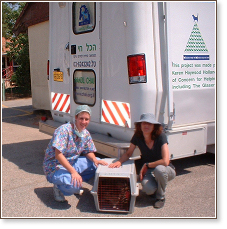 In 2002, to attack this problem that lies at the root of so much suffering throughout the world and that has reached such enormous proportions in the Middle East, support from caring donors made it possible for CHAI to buy and send to Israel the first mobile spay/neuter clinic in the Middle East. The clinic is operated by our Israeli sister charity, Hakol Chai. With the clinic, we can travel from city to city and from school to school, educating and changing the face of the future wherever it goes. Our goal is to help bring in a new era — one in which no puppy or kitten will be born when there is no food to feed her, no roof to shelter her, no one to answer her cries for help when she suffers, because there is not enough money to pay for the very simple spay/neuter operation. The costs of running the clinic are high (salaries, veterinary medical supplies and drugs, insurance, gas, and maintenance). We made an ethical decision not to accept sponsorship from petfood companies that experiment on animals. Therefore, we depend on donations from caring people to keep the clinic running until we can increase the number of surgeries we do per day so that it becomes self-supporting. Professional, aesthetic, very caring, and so organized. What an excellent program to educate adults and children in respect, empathy, and responsibility. Lots of people dump animals on kibbutzim and my cat attracted three others. I couldn't turn them away to starve, so I began feeding them, but the clinic really saved us. It has helped us manage with all these animals and take responsibility for them. Now they're all living calmly and happily together. This is a very positive thing for Israel since there is such a huge overpopulation problem here. Kol Hakavod! All our animals are in excellent condition, feeling and looking like they had no surgery at all. We want the amazing clinic to come back again! The vet was excellent and everyone here is still in shock over the clinic, the crew, the treatment — everything was perfect. An excellent service that will bring a lot of awareness about animals to the Israeli public. The commitment of the staff is fabulous! I was very impressed with the reliability and caring of the crew and the very high class clinic that we were able to have come to our moshav. It's a real mitzvah and I hope you will keep it going! Kol hakavod! Everyone here was extremely pleased at your mitzvah (good deed) mobile. Donate to keep the clinic running. 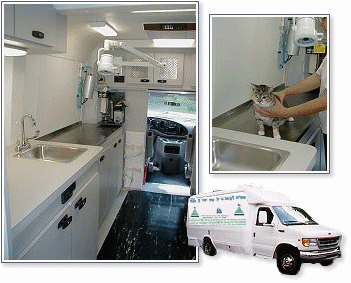 Contact us for pamphlets to display at your veterinarian's office.